Thread: what is your opinion on marijuana stocks? gotta believe Constellation has good info that STATES act will go through.They reportedly paid a 51% premium!! WTF...... Linton is singing a different tune towards US expansion as well, been cautious previously. TORONTO — Canopy Growth’s chief executive talked more aggressively Thursday about the potential for U.S. expansion when and if marijuana becomes federally legal south of the border — one day after the licensed medical marijuana producer got a $5-billion infusion of cash — and believes that even under a Trump government that day will dawn sooner than anticipated. In explaining his bullish outlook, Bruce Linton pointed to a U.S. Senate bill introduced in June that would amend the Controlled Substances Act to exempt marijuana activity that is legal at the state level, as well as to recent comments backing states’ rights on pot from the Koch brothers, prominent Republican donors and businessmen. “I will not go in until its federally legal, at all. But what I’m observing from a distance, are indications that it may in fact become federally legal sooner than later…. State rights have typically been associated with the Republican party,” he said on the sidelines of Marijuana Business Daily’s industry conference in Toronto on Thursday. His comments come after the Smiths Falls, Ont.-based licensed producer announced an additional $5-billion investment from Constellation Brands, which increases the U.S.-based alcohol brand giant’s stake in Canopy to 38 per cent. It’s the largest strategic investment in the cannabis space to date which comes as Canada prepares to legalize the drug for recreational use on Oct. 17. Canopy has said the $5 billion in capital will be used to fuel its accelerated global growth as it gears up to fend off competition from big pharma, big tobacco, consumer packaged goods companies and alcohol firms making forays into the pot space. Linton’s optimistic outlook south of the border is a departure from his prior cautious stance when discussing the U.S. — where the drug is legalized in several states for medical and recreational use but remains an illegal substance at the federal level. The murky legal landscape prompted Canada’s biggest exchange operator TMX Group in October to warn pot companies with business activities that violate U.S. federal law that they could face delisting. Earlier this year, the U.S. president’s top law enforcement official rescinded an Obama-era memo that suggested that the federal government would not intervene in states where the cannabis was legal. But in June, Donald Trump signalled that he would “probably” support the bill amending the Controlled Substances Act, which has been referred to a Senate committee and is known as the STATES act. The STATES act is what may have prompted both companies to deepen their partnership this rapidly, said Martin Landry, an analyst with GMP Securities. “We expect this could effectively make marijuana federally legal in states where recreational consumption is legal at the state level,” he said in a research note. At maturity, the U.S. market could generate US$50 billion in annual sales, Landry added. Canopy has lined up an option to acquire a “humongous” greenhouse in California as part of a broader strategy to enter the U.S. market quickly, Linton said during a question-and-answer session onstage at the industry conference. “Having optionality on assets to become part of the integrated growth of what could be a huge economy is a good way to go. And you’re not breaking laws, because they still grow tomatoes,” he said during the session. When asked about other potential moves to position Canopy for legalization south of the border, Linton said the company had “many, many others” in the works, but would not disclose details. Linton added that the company will focus on key consumer markets such as Florida, Texas and California — and not necessarily the states where cannabis is currently legal. “Where does most of the beer get sold, where does most of the wine get sold?” he said. The Constellation deal comes as other alcohol companies have also made inroads into the pot industry. Earlier this month, Molson Coors Canada entered into a joint venture with the Hydropothecary Corp. to develop non-alcoholic cannabis-infused products. As well, Heineken-owned Lagunitas Brewing Co. recently introduced a cannabis-infused hoppy sparkling water. As part of the investment, Constellation will also receive 139.7 million new warrants, which are exercisable over the next three years. If Constellation exercises all of its existing and new warrants, its ownership in Canopy would exceed 50 per cent. Canadian banks had largely steered clear of the country’s cannabis sector until January, when Bank of Montreal co-led a $175-million bought deal financing for Canopy. this sector is stupid volatile , valuations off the charts.. Better to take profit on news , imo. CARSON, CA, Aug. 23, 2018 (GLOBE NEWSWIRE) -- via NEWMEDIAWIRE -- Solis Tek Inc. (OTCQB: SLTK) (“Solis Tek”), a vertically integrated cannabis technology innovator, manufacturer and distributor, is pleased to announce the additions of Peter Najarian and Tiffany Davis to its Board of Directors. Mr. Najarian is a recognizable contributor on the CNBC mid-day show “Halftime Report” as well as CNBC’s post-market show “Fast Money” https://www.cnbc.com/fast-money/. Ms. Davis is currently the Chief Operating Officer of Solis Tek and has nearly 20 years of experience as a financial restructuring professional working in both management consulting and private equity. Peter Najarian is a founding member of Investitute.com, a financial education and newsletter services company established in 2016. Pete is a founding member of Rebellion Partners, LLC, a private banking company, established in 2016. He is also a founding member of One Chicago, an electronic exchange in futures on individual stocks, narrow-based indexes, and ETFs. He is also the Co-Founder of Hedgehog, a stock, options, and futures trading platform and he co-developed the Heat Seeker™ and complementary programs identifying unusual buying activity in stocks, options, and futures. Following a football career that included several seasons with the NFL's Tampa Bay Buccaneers and Minnesota Vikings, he began options trading in 1992 at Mercury Trading, a market-making firm at the Chicago Board Options Exchange (CBOE). Two years later, he assumed responsibility for Mercury's risk and arbitrage departments. In 2005, Najarian co-founded optionMONSTER, an options news and education firm, and tradeMONSTER, an online brokerage firm. Both were acquired in 2014 by private equity. Mr. Najarian graduated with a BA from the University of Minnesota. Tiffany Davis has nearly 20 years of experience as a financial restructuring professional working in both management consulting and private equity. She has extensive experience in supply chain functionality, financial and operational due diligence, cash flow forecasting, financial statement analysis, development and value retention across multiple industries, including most recently in the cannabis sector. Previous to joining Solis Tek, Ms. Davis worked as a management consultant for a U.S. based cannabis consulting group supporting legal grows, assisting in license applications, developing programs for cultivators, and business structuring for medical dispensaries. Among her previous experience, Ms. Davis served as a Manager of Corporate Advisory for Grant Thornton, a worldwide accounting firms, overseeing accounting and supply chain advisory services during the automotive crisis in the U.S. Ms. Davis received her B.S. from DePaul University and an MBA from University of Chicago Graduate School of Business. Solis Tek Inc. (OTCQB: SLTK) is a vertically integrated technology innovator, developer, manufacturer and distributor focused on bringing products and solutions to commercial cannabis growers in both the medical and recreational space in legal markets across the U.S. For nearly a decade, growers have used Solis Tek's lighting solutions to increase yield, lower costs and grow better to maximize their return on investment. Solis Tek’s customers include retail stores, distributors, ecommerce, and commercial growers. In 2018, Solis Tek expanded into the “touch-the-plant” side of the cannabis business under a contract with an Arizona licensee and its ongoing build-out of a cultivation and processing facility in Phoenix, AZ. For more information, please visit our website, www.solis-tek.com. This press release contains forward-looking statements within the meaning of Section 27A of the Securities Act of 1933 and Section 21E of the Securities Exchange Act of 1934. These forward-looking statements are based on the current plans and expectations of management and are subject to a number of uncertainties and risks that could significantly affect Solis Tek’s current plans and expectations, as well as future results of operations and financial condition. Solis Tek undertakes no obligation to publicly update or revise any forward looking statements, whether as a result of new information, future events or otherwise. Too many out there and too many pump and dump scams. Be very careful when you invest with those small companies, some are still breaking many laws even though the mariujuana is legal in some places. perfectpH system includes the pH balancing capsule and recharge solution kit. It is available in 3 sizes: 35, 100 and 250 gallons. i trimmed some of my MJ position this week...thing ran from like $26 to $37 in week..too heavily weighted in my holdings so i took some off. Still have a large core holding position..expecting a nice run into the Canada legalize date. olis Tek Inc (TSXV:N.V, OCTMKTS:NXTFF) CEO Alan Lien tells Proactive the vertically integrated cannabis product developer the company is branching out from making cannabis products, into developing its "all-in-one" cultivation, oil extraction, and kitchen at its facility in Arizona.Lien says the lab will be revenue generating by 2Q 2019. Lien says the company's core business of cannabis products its still one of its focuses; the company has recently launched its pH balancing system product under Solis Tek's Zelda Horticulture brand. My son works for Merrill Lynch as a financial planner for affluent clients. Merrill Lynch wont give recommendations on pot stocks because it is officially illegal in the USA. A bunch of the older planners all jumped on TLRY shortly after their IPO for their personal portfolios. Talk about a stock that is going crazy. Almost like the Bitcoin of pot stocks. This is a pot thread but I think driver less cars is going to be huge and have been on that bandwagon for awhile. Might want to look at some stocks in that market too. AMD & NVDA are stocks to look at. They have been riding NVDA for quite awhile. Had dinner with my son last night. We were talking about how crazy TLRY was. He said in their office they looked up how you would have done if you had bought $500 of call options 30 days after the IPO and taken advantage of them at their peak. Obviously two key points in time....but he said they calculated that there would have been a $1,000,000 profit in less than 60 days. Now that is pretty damn crazy....would have felt like a drug dealer. CARSON, CA , Sept. 26, 2018 (GLOBE NEWSWIRE) -- via NEWMEDIAWIRE - Solis Tek Inc. (OTCQB: SLTK) (the “Company”), a vertically integrated cannabis technology innovator, manufacturer and distributor, has announced a name and ticker symbol change, its final step in the rebranding of its corporate identity. The new name is Generation Alpha, Inc. and the new ticker symbol is GNAL. The name and symbol change will be effective with the start of trading on Thursday, September 27, 2018. Generation Alpha reflects management’s strategy to leverage business opportunities in legalized cannabis jurisdictions, such as cultivation, processing and retail facilities. The Company will continue to aggressively develop and innovate its lighting division as Solis Tek Digital Lighting and its agricultural products division as Zelda Horticulture. lol, or a brilliant options trader? CARSON, CA, Oct. 18, 2018 (GLOBE NEWSWIRE) --via NEWMEDIAWIRE -- Generation Alpha, Inc. (OTCQB: GNAL) (the “Company” or “Generation Alpha”), a vertically integrated cannabis technology innovator, manufacturer and distributor, is pleased to announce that its Solis Tek Digital Lighting division has launched its new LED lighting system. Las Vegas, Nevada--(Newsfile Corp. - November 6, 2018) - The raging cannabis market has created many a robust business plan and opportunity. Companies are rushing to participate in every aspect of the industry spectrum from facilitator to grower. Very few can claim that they are doing both as is the case for Generation Alpha, Inc. (OTCQB: GNAL), a vertically integrated cannabis technology innovator, manufacturer and distributor. The recently completed name and ticker symbol change is the last mile along a long road that now thrusts a respected purveyor of horticultural products into one of the most lucrative segments of the cannabis industry. Generation Alpha has now gone from successful provider of top-flight horticultural essentials, award-winning LED lights and nutrients, to major cannabis growers in legal municipalities to joining the actual cultivation market, leveraging their own technology pedigree and becoming growers themselves. In 2017, the Company, mainly through its Solis Tek LED lighting division, generated $9 million revenue, but management had bigger aspirations and opportunities in touching the plant. Generation Alpha can now directly participate in one of the most potentially profitable aspects of the cannabis industry in one of the fastest growing states with the added benefit of their own technology and relationships. The breadth of the opportunity perhaps explains Generation Alpha's ability to add a respected national financial media voice to its Board of Directors. Recently, the Company named Peter Najarian to its Board of Directors. Mr. Najarian is a recognizable contributor on the CNBC mid-day show "Halftime Report" as well as CNBC's post-market show "Fast Money" and has a large following. It is important to note that the Company's path to market is short as it expects to be processing cannabis in early 2019. To that end, Generation Alpha will hit the ground running with a 70,000 square foot advanced cultivation and processing facility in Phoenix, Arizona. Currently under build-out construction, the facility is anticipated to become revenue generating in the second quarter of 2019. The Company will maintain and continue to grow its successful horticultural products business, capitalizing on the expanding market as they have so far. Having two cannabis irons in the fire of opportunity is both unique and desirable given the Arizona forecasts from publications in the know that are bullish to say the least. In a recent article, Marijuana Business Daily reports that "Steady growth has characterized Arizona's medical marijuana program over the past few years, and 2017 was no exception as the state reinforced its position as one of the nation's largest MMJ markets. Additionally, Arizona's MMJ program added over 38,000 patients to its rolls over the course of the year - a 34% increase - firmly establishing the state's medical cannabis market as the third largest in the United States." Market watchers Motley Fool speculate that Arizona could have a billion dollar marijuana market in the next four years in this essay from June. These eye-popping numbers explain Generation Alpha's expansion. With the credibility earned through years of assisting others in efficient cultivation of legal cannabis already under roof, adding the potentially deep, deep pools of revenue that often comes with being a direct grower makes sense. Many of the relationships, expertise and understanding of the market are already in-house. And with the proverbial earth moving favorably under their feet as Arizona's cannabis market explodes, Generation Alpha's isn't just changing its name, it's doubling down on a rare opportunity. Generation Alpha, Inc. (OTCQB: GNAL) is a vertically integrated technology innovator, developer, manufacturer and distributor focused on bringing products and solutions to commercial cannabis growers in both the medical and recreational space in legal markets across the U.S. For nearly a decade, growers have used the Company's lighting solutions to increase yield, lower costs and grow better to maximize their return on investment. The Company's customers include retail stores, distributors, ecommerce, and commercial growers. In 2018, the Company expanded into the "touch-the-plant" side of the cannabis business under a contract with an Arizona licensee and its ongoing build-out of a cultivation and processing facility in Phoenix, AZ. For more information, please visit our website, http://genalphainc.com. The Green Light Report is powered by professional journalists with two-decades of experience in public markets. Each subject company that Green Light is contracted to cover is examined through a macro/micro approach that reviews larger events for its primary industry and how it might affect future market opportunities. First tier sources will be studied, cited, and offered to readers. Additionally, material events by the subject company will be noted for the readers' consideration. We often rely on industry experts, Forbes, Bloomberg, The Wall Street Journal and other periodicals of established pedigree who have no relationship to the covered company whatsoever. Statements herein may contain forward-looking statements and are subject to significant risks and uncertainties affecting results. The GreenLight Report and GreenLight IR are property of Integrity Media Inc. (IMI). IMI provides no assurance as to the subject company's plans or ability to effect proposed actions and cannot project capabilities, intent, resources, or experience. The subject company has reviewed and approved this report. This report is neither a solicitation to buy nor offer to sell securities and is for informational purposes only and shouldn't be used as basis for investment decisions. IMI isn't an investment advisor, analyst or licensed broker dealer and this report isn't investment advice. IMI has been paid $1,500 for this report by Tysadco Partners on behalf of and for the benefit of Generation Alpha. Paid reports constitute a conflict of interest as to IMI's ability to remain objective in communication regarding subject companies. Other articles linked to herein have not been individually vetted for accuracy. I own a bunch that I just buy and sock away. You never know with them. More legalization in the USA and the real companies value will sky rocket. State ballots and the departure of Jeff Sessions have led to fresh confidence in the cannabis sector. The cannabis industry is going through a period of huge growth. Two states recently voted to legalize medical cannabis and one voted to legalize recreational cannabis. The departure of Jeff Sessions removes a significant block for the industry. A variety of strategies-some focused on product and others on support services-are emerging to make the most of this market. Generation Alpha, Inc. (OTC: GNAL) (GNAL Profile) has developed a dual strategy to make the most of this opportunity, investing in both product and supplies for producers. MedMen Enterprises, Inc. (CSE:MMEN) (OTC: MMNFF) is financially supporting further legal reform while building up a cultivation and retail business across several states. KushCo Holdings Inc - Ordinary Shares (OTC: KSHB) has grown from a packaging company to one providing a range of support services. As new niches emerge, Green Organic Dutchman (OTC: TGODF) (TSX: TGOD) is staking its claim through a focus on organic, sustainably grown cannabis. Even non-cannabis companies are profiting from this growth, with Scotts Miracle-Gro Company (The) (NYSE: SMG) investing in hydroponics offerings that will supply crucial equipment to cannabis cultivators. Cannabis companies are in a jubilant mood following the results of last week's events in American politics. At the polls, two states voted to legalize medical cannabis while another voted to permit its recreational use. Though Congress lost several pro-cannabis Republicans, a majority for the Democrats, America's less conservative party, is a good omen for reform. And with President Trump's sacking of Jeff Sessions, the country is now rid of a staunchly anti-cannabis attorney general. This opens the way for companies with strong cannabis strategies to make bold moves in the coming year. From entering new states to producing fresh product lines, the options for growth and development are many. 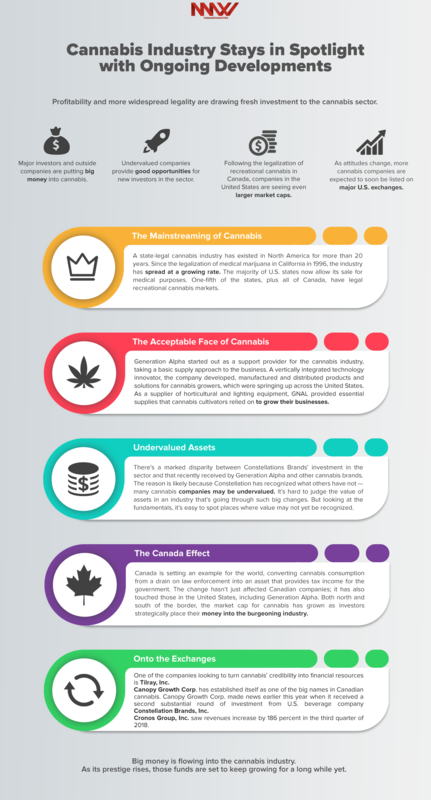 A few key considerations define the strategies of the current cannabis players. Two basic approaches to business strategy currently dominate the cannabis market - one based on infrastructure and the other based on product. However, these strategies don't have to be separate, and Generation Alpha, Inc. (OTC:GNAL) is building strong businesses by combining them. And the way this strategy plays out shows a lot about where the industry is at. The product strategy is an obvious one and typically garners the most public attention. Companies going down the product path focus on the production, processing, and retail side of cannabis. These are the companies setting up farms and dispensaries, feeding the growing demand from consumers across North America. It a strategy that Generation Alpha recently moved into, under its previous name of Solis Tek, with the acquisition of cultivation and processing facilities. The other strategy is to provide support services and supplies for product-oriented companies. As the market grows, there will be more and more need for such services, which profit off cannabis but are better insulated from shifts in the market and its political oversight. Generation Alpha started out with this strategy, as a vertically integrated technology innovator, developer, manufacturer and distributor bringing products and solutions to cannabis growers. Providing horticultural and lighting supplies, the company grew by providing cannabis growers with the equipment they needed. Each strategy can work well on its own, but running a double strategy, while more complex, has real potential benefits. As both supplier and customer for cultivation equipment, companies such as Generation Alpha can create great efficiencies in their supply chains. And by developing both business streams, they can benefit from the security of a picks-and-shovels approach while also accessing the growing profits of the front-line cannabis trade. Choosing which states to operate in is an important consideration for American cannabis companies. Although it is widely anticipated to change, cannabis currently remains illegal at a federal level, and it is only through state-level initiatives that the market has been allowed to emerge. Cultivation and retail effectively operate on a statewide scale at best, so looking at where a state stands now and where it is likely to go in the future is vital to making savvy business decisions. Arizona, where Generation Alpha recently acquired cultivation and processing facilities, provides a useful example of how local conditions shape the market. The state made medical cannabis legal in 2010. Despite a closely fought vote, opponents of cannabis have failed to overturn or limit the market despite ongoing campaigns. The state's supreme court even overturned a rule keeping medical cannabis off college campuses. Arizona's medical cannabis market seems secure. In 2016, an attempt to legalize recreational cannabis in the state failed by a narrow margin. Medical legalization faced a similar setback in 2002, only eight years before passing. As recent generations are generally more liberal toward cannabis than their elders, it is likely that a similar pattern will play out for recreational cannabis, with a successful vote almost inevitable. Companies that have become established under the medical licensing laws will be in a strong position to make the most of this. "We are excited about this opportunity in Arizona and its growth and profitability potential," said Generation Alpha CEO Alan Lien. "We are pleased to have partners such as Future Farm Technologies and Yorkville Advisors to collaborate and support the build-out and growth of this facility. Our collective experience and knowledge in cannabis will position this Arizona operation for success. We are excited to commence Phase 1 of the development and construction of our state-of-the-art cultivation and processing facility and look forward to many additional opportunities in the cannabis industry." The potential of the Arizona market hasn't gone unnoticed by other companies. MedMen has invested heavily in getting into the state, acquiring a top Arizona medical cannabis wholesaler. This is part of a wider pattern of companies spending big to secure their spots in a burgeoning cannabis sector. For example, drinks giant Constellation Brands has spent billions investing in a Canadian cannabis company to give itself a foothold in the industry. Canadian and American companies are looking at cross-border investment, while outsiders are moving into the market as well. This big spending only adds to the strength of infrastructure plays such as Generation Alpha's strong position in cultivation equipment. Much of the money being invested will go into growing more cannabis. That means more hydroponics, lighting and related services will be needed across the legalized states. Any investment in cannabis cultivators ultimately becomes an investment in their suppliers. The next few years promise solid growth for the cannabis industry in North America. Even before this month's political upheavals, analysts projected that the $9 billion industry would grow to $47.3 billion by 2027. The fallout from the mid-terms means that investors can be even more confident about what happens next. The forced resignation of Jeff Sessions removes one of the biggest obstacles to growth for the cannabis industry in the United States. Sessions, a staunch opponent of cannabis, had rescinded the Obama-era memo committing federal law enforcement to non-intervention in state-level cannabis industries. With him gone, cannabis shares rose as businesses and investors looked forward to a more tolerant regime. This won't mean an end to campaigning for MedMen Enterprises, Inc. - Ordinary Shares - Class B (Sub Voting)(CSE:MMEN) (OTCQX:MMNFF), the largest financial supporter of progressive marijuana laws, but it does mean that the company's campaigning efforts are more likely to pay off, creating space for expansion of its cultivation and retail business. The company already operates 19 facilities in four states and has recently announced the addition of a fifth, through a move into Arizona. Despite the limitations created by federal laws, MedMen is showing that cannabis companies can operate on an inter-state level. Like Generation Alpha, KushCo Holdings Inc - Ordinary Shares (OTC: KSHB) entered the sector by providing support services to cannabis producers, in the form of packaging solutions. The company has since expanded its operations, creating a one-stop shop for the cannabis market. Seeing the huge potential currently available, it has recently formed an advisory board to guide strategic growth initiatives, making the most of a constantly expanding market. While KushCo provides another example of the infrastructure strategy, Green Organic Dutchman (OTC: TGODF) (TSX: TGOD) is focused on product. A producer of organic, sustainably grown cannabis, the company is making the most of the connection between cannabis consumption and concern with environmental issues. In a market large enough to start dividing into specialist niches, it is tapping into the higher prices people will pay for organic products. Not every company profiting from cannabis is focused on that market. Lawn, garden and outdoor living company Scotts Miracle-Gro Company (The) (NYSE: SMG) has been benefiting from the demand for cultivation equipment that cannabis's success brings. It recently acquired the United States' foremost distributor of hydroponic equipment, which is crucial to the cultivation of cannabis. As the cannabis industry grows, so too does hydroponics. Political change offers further growth for an already flourishing industry, allowing profits from a wide range of strategies. For more information about Generation Alpha, please visit Generation Alpha, Inc. (OTC: GNAL). NEW YORK, Nov. 16, 2018 (GLOBE NEWSWIRE) -- via CannabisNewsWire – CannabisNewsAudio announces the Audio Press Release (APR) titled “Political Wins Hold Promise for Strong Cannabis Strategies,” featuring Generation Alpha, Inc. (GNAL). Arizona, where Generation Alpha recently acquired cultivation and processing facilities, provides a useful example of how local conditions shape the market. The state made medical cannabis legal in 2010. Despite a closely fought vote, opponents of cannabis have failed to overturn or limit the market despite ongoing campaigns. The state’s supreme court even overturned a rule keeping medical cannabis off college campuses. Arizona’s medical cannabis market seems secure. CARSON, CA, Nov. 28, 2018 (GLOBE NEWSWIRE) -- via NEWMEDIAWIRE -- Generation Alpha, Inc. (OTCQB:GNAL), a vertically integrated cannabis technology innovator, manufacturer and distributor, today announced that Alan Lien, Chief Executive Officer, and Tiffany Davis, Chief Operations Officer, will present at the 11thAnnual LD Micro Main Event investor conference at 12:30 pm PT on Wednesday, December 5, 2018 at the Luxe Sunset Boulevard Hotel in Los Angeles, California. The conference will be held December 4-6, 2018. Management will be available during the day on December 4 and December 5 for one-on-one meetings. For more information about the conference or to schedule a one-on-one meeting with management, please contact Hayden IR athart@haydenir.com. LD Micro was founded in 2006 with the sole purpose of being an independent resource in the microcap space. What started out as a newsletter highlighting unique companies has transformed into several influential events annually (Invitational, Summit and Main Event). In 2015, LD Micro launchedldmicro.comas a portal to provide exclusive intraday information on the entire sector, including the first pure micro-cap index (LDMi), which covers stocks in North America with market capitalizations between $50 million to $300 million. CannabisNewsWire Editorial Coverage: Profitability and more widespread legality are drawing fresh investment to the cannabis sector. Major investors and outside companies are putting big money into cannabis. Undervalued companies provide good opportunities for new investors in the sector. Following the legalization of recreational cannabis in Canada, companies in the United States are seeing even larger market caps. As attitudes change, more cannabis companies are expected to soon be listed on major U.S. exchanges. With a strong pick-and-shovel strategy alongside recent direct investment in cannabis, Generation Alpha, Inc. (OTCQB: GNAL) (GNAL Profile) is among the cannabis companies seeing good growth. Tilray, Inc. (NASDAQ: TLRY) is moving to benefit from fresh investor interest through public offerings in Canada and the United States. Canopy Growth Corp. (NYSE: CGC) (TSX: WEED) has benefited from a substantial investment from Constellation Brands, Inc. (NYSE: STZ), the result of a trend in which U.S. alcohol and tobacco companies eye up cannabis. The industry’s upward trend is also reflected in the soaring revenues of Cronos Group, Inc. (NASDAQ: CRON) (TSX: CRON). A state-legal cannabis industry has existed in North America for more than 20 years. Since the legalization of medical marijuana in California in 1996, the industry has spread at a growing rate. The majority of U.S. states now allow its sale for medical purposes. One-fifth of the states, plus all of Canada, have legal recreational cannabis markets. Yet the cannabis industry remains on the fringe of the American economy, largely separate from the work of mainstream businesses and investors. That’s now changing. Growing numbers of investors are putting money into cannabis, cannabis companies are able to raise substantial capital for growth initiatives, and large enterprises have taken an interest in cannabis-focused ventures with a view to establish partnerships and make investments. With these changes, cannabis becoming fully integrated into financial markets appears to be a logical next step. Over the past few years, the cannabis industry has seen growing acceptance of its place in society and the economy. This is due in no small part to the professionalism of the companies working in the sector, including companies such as Generation Alpha, Inc. (OTCQB: GNAL). The most practically and symbolically significant is the investment of $4 billion in Canadian company Canopy Growth by American beverage giant Constellation Brands. Not only does this move represent a huge financial boost for the company, but it also signifies an important moment for the entire industry. This massive investment from a beverage manufacturer reflects the growing interest of tobacco and alcohol companies in cannabis and their willingness to risk money in a relatively new industry, possibly signifying a bigger wave of change coming down the line. There’s a marked disparity between Constellations Brands’ investment in the sector and that recently received by Generation Alpha and other cannabis brands. The reason is likely because Constellation has recognized what others have not — many cannabis companies may be undervalued. It’s hard to judge the value of assets in an industry that’s going through such big changes. But looking at the fundamentals, it’s easy to spot places where value may not yet be recognized. Generation Alpha’s move into cultivation and processing of cannabis is an example of this. The company recently acquired a cultivation and processing facility in Phoenix, Arizona. GNAL is using its experience in the support side of the industry to turn this 70,000-square-foot space into a technologically advanced growing facility. With the site scheduled to become operational in the first half of 2019, the profit from this is decision should soon be realized. The recent legalization of recreational cannabis in Canada this October showed the stark imbalance between supply and demand in the cannabis market. Within weeks, the country was facing a cannabis shortage as consumers rushed to enjoy a legal high. Similar patterns are likely to play out in U.S. states as legalization — whether for medical or for recreational purposes — spreads across the country. If, as many expect, U.S. Attorney General Jeff Sessions’ departure leads the Trump administration to a more liberal stance, then rising demand is even more likely, ensuring both an eager market and a good price for the product coming out of Generation Alpha’s facility. And then there’s the long view. Big businesses now have a vested interest in cannabis. This interest will naturally lead to heavier lobbying for reform of anti-cannabis laws; not just in the United States, but around the world. The next decade will likely be a time of huge global growth for the industry, thanks to social and political change. The value of companies such as Generation Alpha could grow significantly as these pioneering cannabis companies set their sights on becoming the backbone of a mature global industry. Events in Canada provide the surest signs of the coming shift. As the first G8 country to legalize recreational cannabis, Canada is setting an example for the world, converting cannabis consumption from a drain on law enforcement into an asset that provides tax income for the government. The change hasn’t just affected Canadian companies; it has also touched those in the United States, including Generation Alpha. Both north and south of the border, the market cap for cannabis has grown as investors strategically place their money into the burgeoning industry. Canada is now leading the way in cannabis. While it might take time for the United States to catch up at a federal level, American companies are already feeling the benefits. All this growth means more companies listing on major markets. Together with a broader social shift in attitudes towards cannabis, a change at the top of the economy is extremely likely. As the power of cannabis companies grows, it’s surely only a matter of time before major U.S. exchanges add more American cannabis companies. With that, these companies will be able to tap into even more resources through the finance of major investors. And once the inconsistency between federal and state law is addressed, major banking will add another route to funds. Companies with strong, proven strategies will be best placed to benefit from this surge in funding. With its core pick-and-shovel strategy, Generation Alpha fits the bill. By supplying goods and services to cannabis growers, GNAL will be ideally positioned to profit from the growth while keeping a buffer between its core business and shifts in the price of cannabis. With innovations such as its high-efficiency LED lighting system, the company will be a strong competitor among other cannabis support companies. One of the companies looking to turn cannabis’ credibility into financial resources is Tilray, Inc. (NASDAQ: TLRY). A prominent provider of medical marijuana, Tilray has used a well-developed research and design program to gain an edge in the fast-growing industry. It’s currently using public offerings in Canada and the United States to seek fresh funds from investors, but its ambitions aren’t limited to North America. The company has customers on five continents, thanks to the growing international acceptance of medical cannabis. Through early moves in the sector, Canopy Growth Corp. (NYSE: CGC) (TSX: WEED) has established itself as one of the big names in Canadian cannabis. Working both alone and in partnership with others, Canopy Growth has evolved into a multifaceted company with a strong investment in brand and product differentiation. Canopy Growth Corp. made news earlier this year when it received a second substantial round of investment from U.S. beverage company Constellation Brands, Inc. (NYSE: STZ). That $4 billion investment has made Constellation Brands a substantial shareholder in Canopy Growth, owning a third of the company. The investment was a major coup for the cannabis company, giving it the sort of resources that most of its competitors only dream of. But it may also prove to be an important moment for Constellation Brands, as it adds cannabis and cannabis-infused products to its repertoire of alcoholic drinks. As tobacco and alcohol companies look for ways to deal with their own falling sales, it’s likely that a growing number will turn to cannabis, providing fresh investment for the market. When they do, there will be plenty of strong options. The growth of medical and recreational markets has led to impressive revenue growth for companies. For example, Cronos Group, Inc. (NASDAQ: CRON) (TSX: CRON) saw revenues increase by 186 percent in the third quarter of 2018. By partnering with other businesses, increasing its cultivation space, and getting involved in the Latin American cannabis market, the company has been able to keep expanding its operations. Big money is flowing into the cannabis industry. As its prestige rises, those funds are set to keep growing for a long while yet. NEW YORK, Dec. 03, 2018 (GLOBE NEWSWIRE) -- via CannabisNewsWire – CannabisNewsAudio announces the Audio Press Release (APR) titled “Cannabis Industry Stays in Spotlight with Ongoing Developments,” featuringGeneration Alpha, Inc. (GNAL). Companies with strong, proven strategies will be best placed to benefit from this surge in funding. With its core pick-and-shovel strategy, Generation Alpha fits the bill. By supplying goods and services to cannabis growers, GNAL will be ideally positioned to profit from the growth while keeping a buffer between its core business and shifts in the price of cannabis. With innovations such as itshigh-efficiency LED lighting system, the company will be a strong competitor among other cannabis support companies. CARSON, CA, Feb. 06, 2019 (GLOBE NEWSWIRE) -- via NEWMEDIAWIRE -- Generation Alpha, Inc. (OTCQB: GNAL), a vertically integrated cannabis technology innovator, manufacturer and distributor, today announced favorable results for its new Solis Tek B9 LED light system when compared to major competitors in the U.S. specialty lighting sector in an independent lab test by Californian based Light Laboratory Inc. Independent tests confirm that Generation Alpha’s new Solis Tek B9 LED outperformed Fluence Spyder C2i and Gavita 1650LED in an LED PPF (photosynthetic photon flux) output comparison. Solis Tek 720W B9 LED outputs at least 15% more PPFD* than the industry leading 1000w Double Ended HPS HID System. *Photosynthetic photon flux density (PPFD) refers to the photon flux in a certain area, by measuring how many photons, which contribute to photosynthesis, impinge on the plant per second. This measurement allows you to know how much light can be absorbed by the plant. The unit is given in µmol/(m2s). In other controlled tests, the Solis Tek 720W B9 LED dispersed up to 40% lower heat rating than traditional 1000w HID fixtures and yielded 15% more flower. Gram per watt (gpw) efficiencies increased from 1.2 gpw to 1.9 gpw. Financing opportunities available through a third party affiliate. Light Laboratory, Inc. is an independent photometric testing laboratory that specializes in testing high end luminaries. Established in 1974, founded by Bill F. Jones, Light Laboratory serves as the leading testing laboratory in the lighting industry and provides high-quality photometric, radiometric, electrical, thermal and life test data. For information on Light Laboratory, Inc., please visit: www.lightlaboratory.com. CARSON, CA, Feb. 11, 2019 (GLOBE NEWSWIRE) -- via NEWMEDIAWIRE –Generation Alpha, Inc. (OTCQB: GNAL),a vertically integrated cannabis company and technology innovator, manufacturer and distributor, is pleased to announce the appointment of international businessman and entrepreneur Mr. David Lenigas to the Board of Directors. Generation Alpha, Inc. focuses on bringing products and solutions to commercial cannabis growers in both the medical and recreational space in legal markets across the U.S. For nearly a decade, growers have used Generation Alpha’s lighting solutions to increase yield, lower costs and grow better to maximize their return on investment. Generation Alpha’s customers include retail stores, distributors, ecommerce, and commercial growers. In 2018, the Company began the process of expanding into the “touch-the-plant” side of the cannabis business with a contract with an Arizona licensee and its ongoing build-out of a cultivation and processing facility in Phoenix, AZ. For more information, please visit our website,http://genalphainc.com.